In the short history of computing, machines have crept ever closer to humans. In the early days, they occupied an entire room for computer-operators to enter. 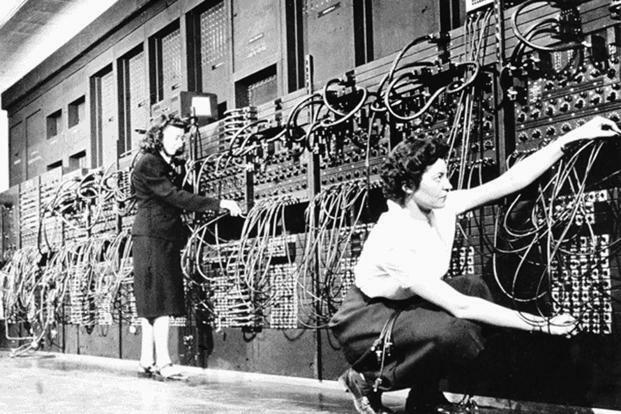 One of the first computers—the ENIAC from the mid 1940’s—had a massive footprint of 1,800 square feet. With passing decades, computers became smaller and more accessible. The first personal computers appeared on office desks in the mid 1970s, and in the 1980s entered our homes. In the 1990s, like a species-jumping virus, they bridged the distance from our desks to our bodies in the form of the mobile phone. Suddenly, we were carrying a computer on us, wherever we went. Today, wearable computing includes fitness trackers on our wrists, VR glasses for our eyes, and sensors woven into yoga gear. The shrinking separation between man and machine is not just physical. How we interact with machines has also evolved to feel less separate and more organic. Early computers were programmed with wires, plugs and switches, and then punch cards—stiff paper with holes representing computer code. Over time, we moved to keyboards, and then mouses, which came closer to the way we communicate, but hardly natural. It took the invention and commercialization of touch screens for the human-computer ‘interface’ to truly start to dissolve. Today, voice-controlled devices such as Alexa and experimental mind-controlled limbs hint at a future where interfaces will vanish altogether. As devices integrate into our environment, and with us, they change the very nature of what it means to be human. Always at hand, phones extend fundamental human capabilities. We can capture, store and retrieve information with greater capacity and fidelity than our brains alone. With two-thirds of the world carrying a phone, this ubiquitous device can no longer be considered just another tool—arguably it constitutes an upgrade of our species. And this is just the beginning. As the Artificial Intelligence (AI) revolution gathers pace, upgrades will arrive fast and furious in a breath-taking evolutionary sprint. This dynamic future is rich with possibilities, as also with peril. The dangers are two-fold. Firstly, we risk abdicating too much decision-making to machines that may not be up to the task. Anyone who has reached a dead-end chatting with support on a website, only to discover a clueless machine on the other end, will understand how technology can get it wrong. Secondly, we risk our brains, which need exercise as much as the rest of our body, falling into disuse and disrepair. The early signs are here already. Remembering phone numbers, once a source of bragging rights, is no longer of interest. Google drives us to work and meetings, taking the task of navigation off our minds, and finishes our sentences on emails, relieving us of the need to think more than necessary. Is this paranoid fear-mongering? I think not. Walking past the large glass windows of a fitness gym, with neatly lined up rows of sweaty bodies on ellipticals and treadmills, one sees evidence of the physical atrophy that machines have already wrought. The very human acts of walking, running, climbing and jumping, have been rendered obsolete by vehicles, moving walkways, escalators and lifts. Is mental exertion next on the list of obsolescence? There is hope that that may not be the case. It turns out that some of the best early results from AI have come when machines and humans work together. BMW found that robot-human combinations in their factories were 85% more productive than when working on separate assembly lines . An AIIMS study concluded that AI-based diagnostic algorithms perform significantly better when they incorporate a radiologist’s input . Software maker Autodesk’s Dreamcatcher AI works with designers through an iterative process of product design, with designer and machine working hand-in-hand while focusing on their respective strengths. The designer provides specifications and aesthetic inputs while the machine churns out matching design samples for the designer to discard or further improve. Whether these early examples of symbiosis are indicative of the future, or simply a passing phase in the intertwined evolution of man and machine, is anybody’s guess. One hopes for the former, else we may drift into a dystopia of brain-fitness gyms, with our minds plugged into artificial stimuli from the equivalent of today’s ellipticals and treadmills. Brain Zumba anyone? Welcome to the Machine is a weekly column on the future impact of AI on workplaces and working lives.